2007 March « SEND IT!!! Was just forwarded the link to a nice article from the Marin Independent Journal that provides a good overview to the kitesurfing activities in the Bay Area with a focus on the contributions being made by the St. Francis Yacht Club. It’s titled St. Francis Club embraces kitesurfing. Several of the locals I ride with at Crissy Field are featured in the article, most noteworthy of them being John Gomes whom was among the racers in the picture of that I included after the World’s First Upwind Kitesurfing Race post. Johnny is fourth from the right in the back row next to me, and was the one responsible for creating this event that is with us to this day. Every other Thursday afternoon for a few months starting in April, you can see one of the kitesurfing races off of Crissy Field right in front of the St. Francis Yacht Club. It’s always entertaining, but especially so on days when the wind isn’t cooperating. Lil’ Pinot and I just got home from a wild & wacky evening with new and old friends on what set out to be a Passover seder, complete with us bringing salad for 20 people, that instead turned into a visit to the local Hickiry Pit in Walnut Creek the local diner with the truly Americana flair. You see our dear friend had decided to cancel the seder but forgot to tell us in between his altered simultaneous dealings with family and business crises. The Hickiry Pit was great. The most recommended item on the menu, the “RIBS”. I went with the tri-tip, Lil’ Pinot with a turkey & cheeeez omelet. This place was a total throw-back to some spots I used to worship back in my college days in da ‘Burgh (Pittsburgh, PA for the uninitiated). Fries, baked potatoes or hash browns as a side with any meal. Even got special pricing for two entrees or even steeper discount on three. Gotta love it. Well, after an evening of serendipity the restaurant’s ever-so-friendly staff provided the full gamut of entertainment, first by dousing the arm of my white shirt with a healthy amount of gravy (yeah, the waitress than escorted me to a tap where she proceeded to soak my entire sleeve in cold water with my arm still in it), to then arguing with our vegetarian friend that the piece of turkey from his veggie omelet that we all saw and another one of us tasted, was not turkey after all but a piece of mushroom…NOT! This, with another non-resemblant piece of mushroom on the side of the plate for comparison purposes. Our friend also amazed us with his encyclopedic recollections of historical events relevant to Trieste, not to mention other trivia, leading me to call him the human Wikipedia. After one of the guys at the table, from Trieste mind you, corrected our buddy on the reference to laws being passed for Jews to be able to own land, we realized he was even more than the human wiki than we had originally expected but now some one was going in and updating our human wiki :) Needless to say, a fun time was had by all, and this will definitely qualify as one of the most bizarre and unforgetable Passovers I have ever spent. I’d venture to say that it will likely retain that title for a long time. The commission’s presiding officer, Marine Col. Ralph H. Kohlmann, is expected to hear the details of what Hicks has admitted to Tuesday afternoon, and the full 10-member military commission could gather here by the end of the week to determine a sentence said Maj. Beth Kubala, spokeswoman for the military commissions, as the tribunals are formally known. Hicks changed his mind about entering a plea after more than four hours of pre-trial procedures in which his primary defense attorney, Marine Maj. Michael Mori, failed to persuade Kohlmann that he needed more time to prepare. Mori was left alone at the defense table with the defendant when civilian criminal defense lawyer Joshua Dratel was barred from participating because he refused to promise to adhere to procedural rules that have yet to be defined. Hicks’ initial appearance stunned his family and court spectators, as he was scruffy, wore his hair halfway down his back and had gained at least 30 pounds since he was last seen at a Guantanamo proceeding in November 2004. My aunt used to be a flight attendant with PanAm back in the days when people still used the term stewardess. She has some fond memories of those days, having met so many people from all over the world. She had also been involved in some flights to pick-up soldiers in Vietnam during the war, and has some very touching stories from her interactions with soldiers who were wounded or simply happy to see or fall in love with a smiling face on their way back home. My fondest recollection of the airline was the first time I got on a 747 as an unaccompanied minor and got to hang out in the lounge area upstairs. That was so cool. When wondering who we really have to fear, I’m beginning to come to the conclusion that it’s our very own Department of Homeland Security (boy, just using the word “homeland” gives me the heebie jeebies). Remember when we got the recommendation that in the event of an Anthrax or other biological attack, we should cover our windows with plastic and duct tape. Well in the vein of “more of the same advice your parents never gave you”, here’s a doozie from on Bruce Schneier’s blog about a recent FBI Bulletin on on terrorist bus drivers, or as South Park’s Officer Barbrady might say, “move along, nothing to see here”. Cory Doctorow on Boing Boing has a nice follow-up here. Not with a whimper, but with a BANG, kitesurfing season really kicked off this weekend. After a week where we were getting teased with light winds during the last three days, things turned for the better on Saturday. We knew something was up when the deep fog came over the Bay and looked to sock us in to the Summer pattern. Two of my kitesurfing crew and I chased the wind a bit by going to a little known spot in San Rafael only to find that the winds were light. Of course, we started cursing a bit given that we had already endured a tough week of jonesing for the winds to pop. At which moment that we checked our pagers only to see the wind pop at Crissy Field. Sure it was foggy and cold, but it was WINDY!!! We got there in no time flat, pumped up the kites, got into our warmest wet suits, rigged our lines, when all of a sudden, the gods smiled upon us and parted the fog to a beautiful sunny afternoon right at 2:30pm. Amazing. By the time we got underneath the Golden Gate Bridge it was a love fest between us, the winds, and the smooth swells coming into the south tower. At least 10 kiters were out there frolicking under the bridge, throwing high jumps or surfing the swells because of the steady but powerful winds coming through the Gate. Back in late 2005, several book publishing stake holders decided to sue Google regarding the company’s Print Library Project. While at first I thought of this as just another old industry resisting change, it soon began occurring to me that much more was at stake here and worth further review. The implications become important as well, when we begin discussing other seemingly unrelated issues that are raised by entities like the AttentionTrust about who owns users’ clickstream exhaust and more recently issues raised by several news publishers in Belgium. So first let me start with the idea that search engines have been spidering the Web pretty much since the mid-90s, as far as I can remember. Companies like Excite, Lycos Alta Vista, Inktomi, Google, etc. John Battelle’s book, The Search: How Google and Its Rivals Rewrote the Rules of Business and Transformed Our Culture, provides a good account of all of this. The role of spiders is to go out on the Net, and bring back the content on Web pages (though in some cases they also pick up content from Office documents and PDF files) and index these in their search engines. In some cases, all that the search engine saves is the indexed information, in others they actually keep an archived version of the page for future reference (I may be wrong on the specifics here, but that’s the general idea). However, from a search perspective, all of the search engines keep within the ‘fair use’ doctrine and only display a sentence or two where the search result occurred and provide a link to the actual content for access to the complete text. By adhering to ‘fair use’, this in effect keeps search engines on the right side of copyright law. As well, from the Web site publishers’ perspectives, because people use the search engines to find information and as a result so much of their visitor traffic comes from the search engines, it’s a mutually beneficial arrangement. My key point here however, is that although the entire Web site is being spidered in order to index the full content of a site, because the whole site is never rendered and so no substitute to the actual site is provided, search engines do not appear to be violating copyright. On the Net, spidering is an automated process, but when dealing with physical books this requires a manual and semi-automated approach. There are now some robotic machines that handle the scanning and digitizing of bound books. These would in effect act in a manner somewhat analogous to spidering content, with the exception that a human being has to manually feed in the book(s) to be scanned. The purpose of doing this is to help people identify and find books that contain the content of interest to them. However, there are externalities to this. For one thing, search engines can do more with the content than simply make it findable. They can analyze this content and determine is semantic relationship or relevance to other content. They aggregate analytics about the page, like how many people doing a search clicked on the search result for that content?…how many times did a particular piece of content come up in the search results?…how many links exist to that content page from other content pages (can you say Pagerank? )?…etc… These externalities could be regarded as the exhaust off of the content. This other stuff you can do and learn about the content by virtue of aggregating and analyzing it can also bring a tremendous amount of value all from the use of this copyrighted content, though none of that value goes to the copyright owner. Today, that value resides within the search engines like Google, Yahoo!, MSN Live, and Ask.com. It’s almost like the search engines are parasites to the aggregated content. They live on by the will of the content which is itself only found online by the will of the search engines. Talk about a conundrum. Well, one important capability which is provided for online is that a site can have a robot.txt file indicating the site’s spidering policy, including not allowing for the site to be spidered at all. It is this simple capability for which an off-line or book world equivalent must be found. Effectively a way for book publishers or copyright owners to be able to “opt-out”. While this may not be a smart business decision for them, it should be a capability much in the same way that it exists as a capability for web pages. This exhaust that I refer to from the aggregated content seems similar to that which is generated by users’ clicking activity and aggregated by advertising networks. Hence, where the AttentionTrust is promoting the idea of users being able to opt-out of being tracked (or cookied), this is functionally equivalent to users being able to indicate their robot.txt file for not wanting to be tracked. Note that this would create added incentive for the ad networks to offer real value for users to allow such tracking to continue. Hence the quality of the offerings made to tracked users should also be commensurately higher and the conversions for advertisers should then increase. All of this resulting in fees to the ad networks also increasing. Seems like a win-win-win all around. Not being an attorney myself, nor having any authority to assess how the book publishers lawsuit might go, I’d say that if the courts rule indiscriminately for the plaintiffs (in this case the Authors Guild), without considering how these issues are addressed online today, then they’d in effect also be ruling that search engines could no longer spider content without the explicit consent of the copyright owners. I believe this could be a bad precedent to set as it could be very impractical to require this inclusion process if it were not automated as it is with the robot.txt file. Effectively, what should be facilitated are tools for copyright owners to put all of their works up online (even if not visible to browsers) and leaving them the option for these to be included in the search engines with a legally enforced robot.txt file. Where today enforcement of the terms of that file are more voluntary than required, these could be given more powerful legal standing. Just thinking a loud here, but it seems like these issues are gaining some momentum and have to be addressed sooner rather than later. Eric Due, one of the crazies that I’m frequently kitesurfing along side of likes to on occasion mount a camera to his kite while he rides just to see the effect. He posted one of those rides from Sherman Island and it’s pretty cool to see him action from that vantage point. Figured I’d post it here for others to enjoy as well. He does a couple of kite loops along the way which is why you see the camera do a full 360 in a few of the late shots. Gotta love it. The Open Data 2007 Conference really brought out some worthwhile issues that will need to keep getting discussed and debated as these are fundamental to the continued development of the Web’s underpinings as well as the business models being developed by many early stage and existing companies in the space. These issues also need to get resolved in some fashion soon before the swell of public opinion from the uninitiated forces policy makers and politicians to impose more naive rules and regulations that suppress important developments in favor of keeping the status quo of onerous laws that only serve to support the interests of existing business stake holders. For those interested in comments, discussions, and pictures that came out from the conference, go check out the Open Data 2007 Conference Wiki. This event was graciously hostedby Reuters in participation with the AttentionTrust, two organizations struggling through these issues today. Both Gerry Campbell from Reuters and Seth Goldstein from the AttentionTrust put together a wonderful event laying out great topics for discussion and setting out an agenda that was both intellectually stimulating and well in line with the issues we need to contend with immediately. 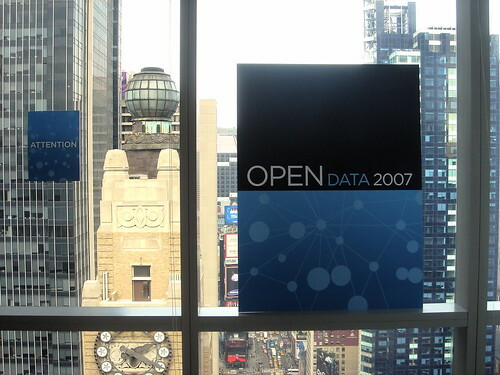 I’ve been attending the Open Data Conference in New York at the Reuters office. Good stuff. There’s a real good post about last night’s dinner discussion at Roger Ehrenberg’s blog, Information Arbitrage.